The problem with finding a large, sunlit, beautiful one-bedroom apartment is that it costs two arms and two legs. 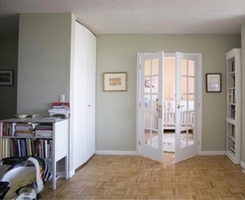 Rather than sulk away from the opportunity, think about splitting the rent in half by converting it to a two-bedroom. How? It’s simple—add a wall. These “pressurized walls,” alternately called thank-God-for-some-privacy partitions, are inches-thick and made from standard building material. They can incorporate windows, French doors, and crown molding. You can even paint them, hang photos, and build them at an angle. The downside? “Pressurized” can often be synonymous with “paper-thin,” so don’t expect them to do wonders for your love life. When you’re searching for an apartment, some landlords and brokers will indicate whether a room is appropriate for a pressurized wall by calling the apartment a “stretch” or “convertible.” A one-bedroom could be “converted” or “stretched” to two bedrooms, a two-bedroom could become a three, and so on. Pressurized walls are most popular in New York, where rents are through the roof. Try the LivingSpace Company, the New York Wall Company, Manhattan Pressurized Walls, and 1 Wall 2 Rooms. To get the wheels turning, Manhattan Pressurized Walls has a basic FAQ that may be worth skimming. Even if you don’t live in NYC, these companies may be able to refer you to the right people in your area. Before doing anything, talk to your landlord and be prepared to persuade him with assurances that the wall is temporary and won’t cause damage to the existing structure. Many wall companies offer insurance, so building management can breathe easy that if anything goes wrong, it’ll be fixed. Some buildings may even recommend an installer they trust, but in all cases you’ll be responsible for removing the wall(s) before your lease is up. Once you’ve found a company, provide them with some sort of floor plan and work with them to determine which type of wall fits your lifestyle. Try to book your installation during off-season (i.e. anytime college students aren’t moving in or out). Count on spending about $1,000 over a two- or three- year lease for a professionally done job. These walls really are cool looking and is cost-efficient compared to normal ones. I got mine from All Week Walls and somehow I haven't found any regrets on using it.